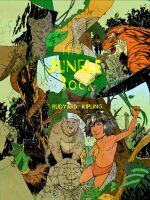 This isn't Disney's "Jungle Book", it's Rudyard Kipling's. I loved Kipling's book as a kid and read it avidly, so much so that I, too, wanted to live in the jungle, with bears, wolves and panthers as my brothers. As a grown-up, I can now see the class struggle going on within the pages of Kipling's jungle opus, and even feel a bit sorry for Shere Khan (he was born lame, after all, which is why he became a man-eater), but my fascination still endures, so I created this tribute, which I've named "Savage". Hope you like it! This is beautiful! Could very well be an illustration in some book ^^ I love how you drew the animals and how you placed them! I could quibble about the odd detail, like the fact that Mowgli didn't get the knife until after he attacked Shere Khan with the "red flower", but on the whole this is an excellent piece of work. A really awesome job on the detailing and design of these guys and the picture too!!! I can see Chil here is a vulture, which would be how I like it, also including Tabaqui as a hyena. Was very impressed by the book also. It was one of most important books of my childhood. Its very nice to see artists of 21th century till paying tribute to such wonderful masterpieces of literature. 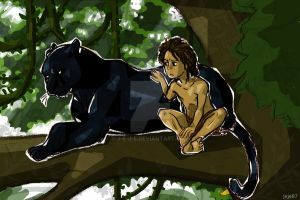 Yeah, Disney's Jungle Book is an entirely different animal (so to speak) than Kipling's. It's not bad, it's just different. It seems that Walt wanted a much lighter, more humorous approach for the story, and it worked as a family animated film. But it's a far cry from Kipling's dark tale.